Our long pause in Tucson allowed us the time to complete some much needed tasks before pushing on to the Pacific. The primary goal was getting holiday cards and gifts prepared and mailed, which took one full day and part of another. But we had to make time to visit the park dedicated to one of nature's most fascinating specimens—the saguaro cactus. All around the city one sees saguaro cacti used in landscaping and growing along the roadside. And since 1933, they have been protected within Saguaro National Park. 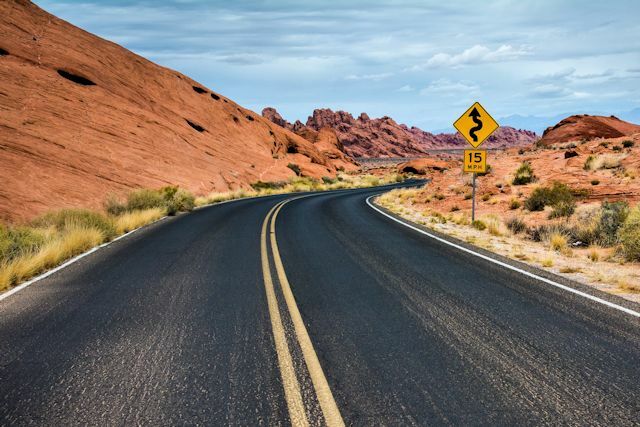 This magnificent tree-sized plant is widely recognized as the iconic symbol of the Southwest and even appears on the Arizona license plate. 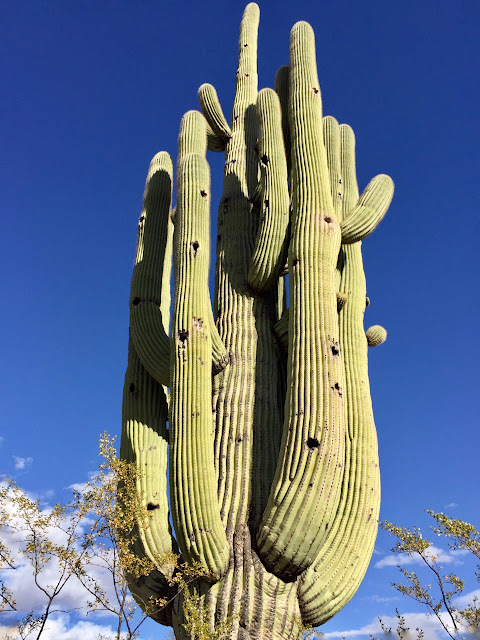 Renowned for its variety of humanlike shapes, the saguaro grows only in the Sonoran Desert, which stretches from Arizona to Mexico and California. Although it is one of the hottest and driest regions of North America, the Sonoran Desert supports a rich variety of plant and animal life. Midday temperatures often surpass 100° in summer, and less than 12 inches of rain fall in a typical year. Often months pass without a drop of rain, yet the plants and animals of the Sonoran have adapted to survive under these harsh conditions. What the saguaro cactus and some other plants of the area cannot withstand is cold. When the park was established in 1933, it protected a thick stand of saguaro on the east side of Tucson. After a 1937 cold front brought record low temperatures to the area, the cacti began to die at an alarming rate. Scientists struggled to identify the disease that was killing off the giants. Not until another killing freeze in 1962 did researchers realize that it wasn't disease but cold that had undermined the cacti. 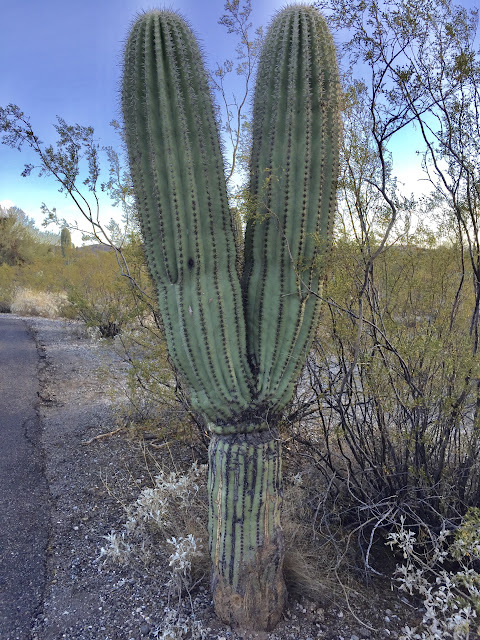 Saguaros, they determined, are vulnerable when temperatures drop below freezing for more than 20 hours. After the number of saguaros declined in the park again, another remarkable stand of the cacti was found west of the city of Tucson and added to the park as a separate district. When we were here three years ago, we visited the western district. This time, we checked out the one to the east. Although they often reach the size of trees, saguaros are slow growers. A ten-year old specimen is typically no taller than 3 inches. One mature plant may produce tens of thousands of pinhead-size seeds each year, but the odds of survival for each micro seed are quite small. Only a tiny fraction of those seeds will grow to adult plants. Those with the best chance are the ones that grow under small desert trees such as palo verde and mesquite. Called "nurse trees" for their nurturing relationship with the cacti, the trees protect seedlings growing under them from the desert's most intense heat and cold. Once it has gotten help to get started, the saguaro itself has many features that help it to thrive in its harsh environment. Spongy flesh surrounds a system of woody ribs that give the plant structure and strength. Accordion-like pleats in the plant's flesh enable it to expand to hold water collected through the roots. Though the roots grow only about three inches below ground, they stretch as far from the main trunk as the height of the plant. In a single rainfall, this extensive network of roots can soak up enough water to sustain the saguaro for a full year. On younger saguaros, spines protect the plant's tissues from hungry animals as well as shading the plant and shielding it from drying winds. Its waxy skin helps to reduce moisture loss. Despite their protective system, saguaros often serve as home to a variety of birds who excavate holes in the trunks and larger arms. Since some species dig new holes each spring, their previous holes provide homes to other birds. Insulated by the the saguaro's thick walls, these retreats are often 20° cooler than the outside in summer and 20° warmer in winter. Other birds, such as red-tailed hawks, are too large for interior spaces and build bulky nests at the juncture of the saguaro's branches. Only in recent years have the cactus forests of Saguaro National Park reached the point that new growth is outnumbering deaths. Saguaros may die of old age, lightning, wind, and even drought, but the biggest threat in Saguaro National Park is cold. Ironically, the area selected for a preserve to protect this magnificent plant is at the northern and eastern edge of its range, where winter temperature extremes are most likely. Tomorrow we'll leave Tucson and drive across the Sonoran Desert to Yuma on the western border of Arizona. We hope to continue seeing these stately giants as we travel across the state. Loved: The opportunity to be in the presence of these remarkable desert giants. Lacking: Water. All the "rivers" around the area are currently dry beds. Learned: We learned again the correct way to pronounce saguaro: suh-WAH-roe.